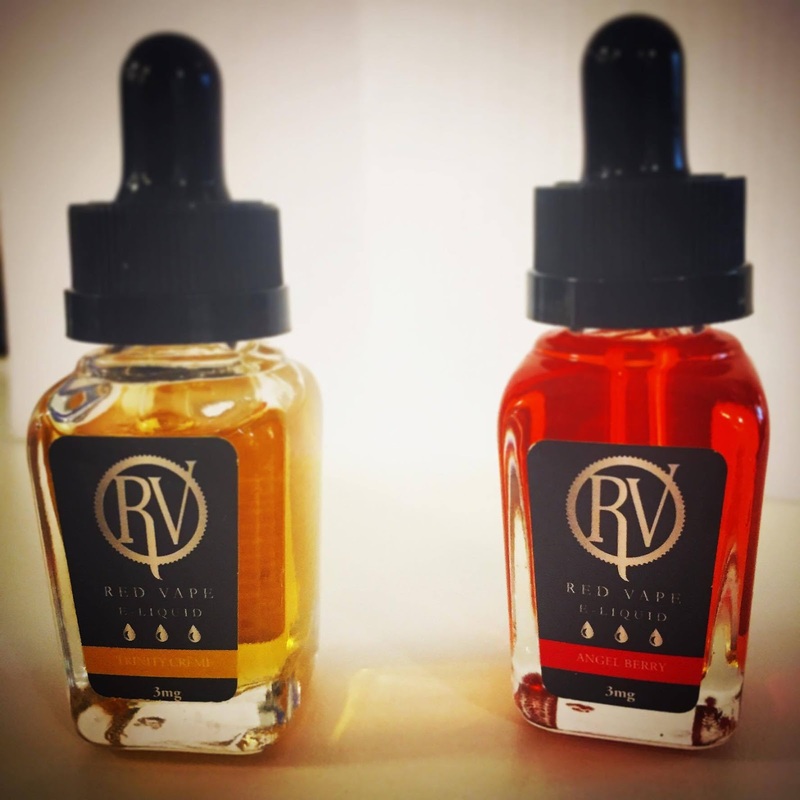 We were sent 2 e-liquids to review from the lovely people at Red Vape. In January 2016 Liam stopped smoking and switched to vaping instead since then he has tried a range of flavours from a range of different companies however he hasn't ever sampled any of Red Vapes products so the opportunity to review some of their liquids was an opportunity he wasn't going to pass on. There is also a discount code at the bottom for you to use on the website. The remainder of the post will be written by Liam. 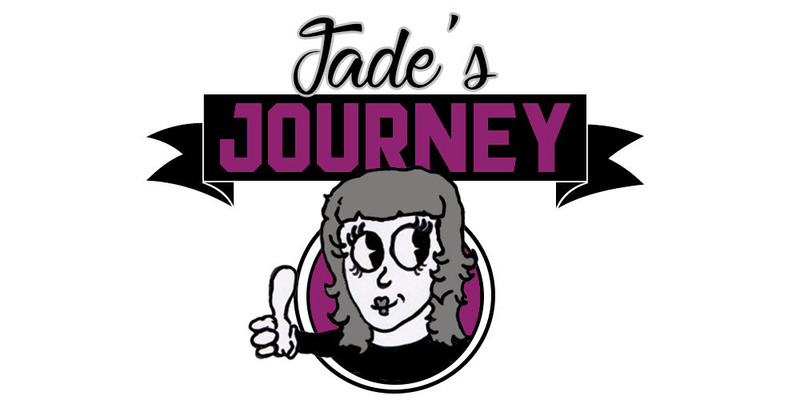 Once Jade told me we had teamed up with Red Vape I couldn't wait to put my order in. In truth I had never really heard of the company before but after looking through the liquids on there website I was extremely impressed with the variety of liquids they had on offer. Many companies usually just focus on one flavour segment be it tobacco, fruit or custard/desserts. Personally I am not a huge fan of the tobacco flavoured liquids my usual go to flavours are fruit based liquids. I settled with Trinity Creme and Angel Berry. The description of both flavours were mouthwatering, Trinity Creme, a vanilla custard with caramel and a hint of nutmeg. The nutmeg is quite seasonal around this time of year as well. The Angel Berry is described as mixture of Raspberry, Dewberry and blueberries with an extract of granny smith apple this is all topped of with water mint to provide a subtle exhale flavour. The liquids arrived in a matter of days, like a kid on Christmas day morning I couldn't wait to open them up and start vaping them. The first thing that struck me was the packaging, for a liquid priced at a more than reasonable £9.99 the packaging was similar to that you would expect with many premium liquids sold for a higher price. The bottle were again much better than you would expect for a liquid priced so low. Many companies will just use plastic bottle that you can squeeze to fill up your tanks, it is only when you get to the higher end of the price market that bottles become glass and you use the pipette to fill your tank. Red Vape offer a high quality high end product on a low budget. The glass bottles were modelled perfectly they were curved, sleek, stylish. They were also filled with some of the most vibrant colour I have ever come across in vaping, especially the Angel Berry. Once I opened the liquids I smelt them before I vaped them. In my opinion if it smells good, it will taste good. The Trinity Creme smelt exactly as it was described, a vanilla custard. The Angel Berry smell was well and truly mouthwatering if it was a drink I would down a whole bottle (just don't ever drink e-liquid...trust me) I couldn't quite put my finger on what the smell reminded me of so I asked one of the lads I work with, within seconds he nailed it... The lollipops from Sherbet Dip Dabs. So, the liquids passed the eye test and the smell test but would they pass the taste test? Of course they did. I first tried the Trinity Creme, usually I avoid Custard based liquids, mainly because if you coil is slowly dying custard based liquids in my opinion become unbearable. I was extremely impressed with how smooth the liquid was. On the initial inhale your greeted by a sweet vanilla taste that slowly faded into a caramel undertone. The nutmeg then joined the party on the exhale and it left a nutmeg taste tingling on your tongue in-between vapes. As always when someone in the office has a new e-liquid everyone whether they are experienced or novice vapers needs to have a try and this occasion was no different, every single one of them enjoyed the taste this liquid presented at first and then left behind, it was a clean sweep for the guys at Red Vape. It took me a matter of days to go through the full bottle of Trinity Creme so the Angel Berry was opened up. The flavour in this liquid was a little more subtle than the Trinity Creme but was just as good. On the inhale you had a mixture of all the different berries topped off with the sweet juicy apple kick at the end, the exhale was when the water mint kicked in, this helped add a little something different to the usual fruity liquids available on the market. Again, I let people from work have a taste. This liquid unlike Trinity Creme was met with mixed reviews, none of them particularly negative. They ranged from "Love it" to "It would be my emergency liquid" In my honest opinion I thought it was just lacking a little more fruity kick, if the water mint was replaced with a strawberry kick I think it would be a favourite amongst a lot of vapers. 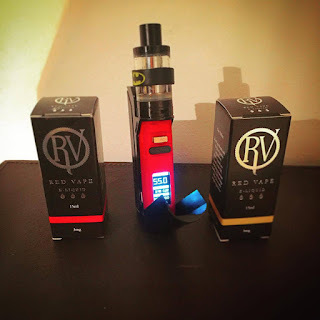 It is worth noting that although I was testing these liquids in my RX-75 kit which allows me to vape thicker liquids with a higher VG at a high level of Watts, due to the 50/50 split you can use Red Vapes liquids in any set up you may have. These would be perfect little stocking fillers for a loved one who use an e-cig, they have so many different flavours so they really do cater for everybody. I know they are on my santa list. 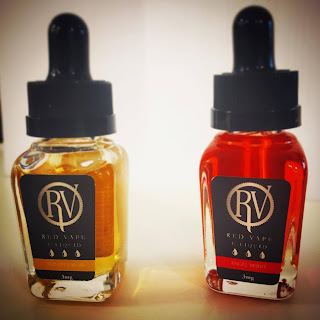 To Sum up Red Vapes liquids in a few words it would be, affordable, professional, beautiful, mouthwatering and smooth.... essentially it is everything you could want from an e-liquid and a supplier. Thanks for reading, as usual if you want to interact with me you can grab me on the below. Disclaimer: We were sent this product for free as a review, this has in no way had any impact on the review and the review is based on my personal opinion of the product.